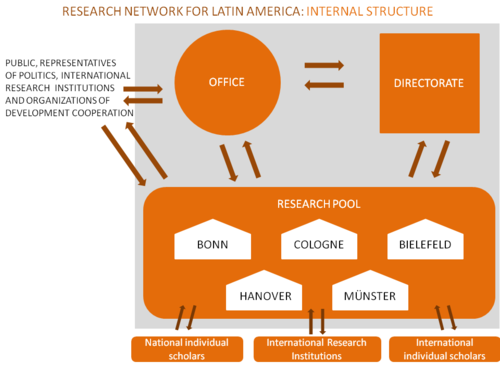 The Research Network for Latin America consists of three institutions: the competence pool, the board of directors and the coordination office. The project staff, i.e. the research pool and the coordination office, meets regularly to discuss their specific research, to coordinate a joint approach and comment on interim results and problems. 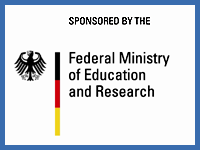 To ensure an active exchange between the working groups, in 2010-2014 the staff organised four annual symposia, several workshops and summer schools (see Network Events). In alternate years, each working group was responsible for the preparation of the symposium with regards to content and one of the three participating institutions is the host. In addition, in the fourth year, the symposium took place in Guadalajara. In 2014-2016 various workshops will be organised by the respective sub-projects in order to maintain and foster a further scientific and non-scientific exchange. Besides the permanent members of the research pool, there are collaborations with other institutions and individuals. One important objective in particular is to integrate scientists from Latin America (see Fellows). Prof. Barbara Potthast, Department of Iberian and Latin American History, University of Cologne. She is coevally the network coordinator. Prof. Dr. Wolfgang Gabbert, Department of Sociology, Leibniz University Hanover. The board of directors is responsible for the Research Network in matters of staff and project decisions, and also actively works on the research areas. The coordination office is responsible for the organisation and coordination of the content of the Research Network, it represents the Research Network, it is responsible for organisational processes and collaborates closely with the members of the research pool, e.g. in the planning and execution of regular work meetings. It consists of managing director Bea Wittger and an assistant. Additionally, in the first two years the Faculty of Arts of the University of Cologne funded a position of a further research associate.